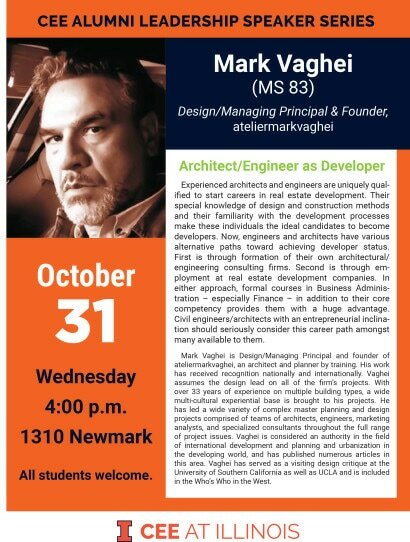 On October 31, Mark Vaghei was invited to speak by Benito Marinas ( https://cee.illinois.edu/directory/profile/marinas) the Dean at The Department of Civil and Environmental Engineering at The University of Illinois, Urbana – Champign. “When Benito asked me to speak at the University, I thought about the topic of my talk and came to the conclusion that instead of showing the typical project slideshow, I wanted to speak about my career in the last 35 years, especially my more recent fascination with Real Estate Development and how us Architects and Engineers are ideally suited to pursue paths leading to a career in Development” Says Mark Vaghei, AIA (http://www.atelierv.com/). During Mark’s visit to the campus, he met with various faculty at the department including Jermey Guest (https://cee.illinois.edu/directory/profile/jsguest), Wen-Tso Liu (https://cee.illinois.edu/directory/profile/wtliu), Mani Golparvar (https://cee.illinois.edu/directory/profile/mgolpar), Ashlynn Stillwell (https://cee.illinois.edu/directory/profile/ashlynn), and Jeffery Roesler (https://cee.illinois.edu/directory/profile/jroesler) and heard a short presentation about each of their current research in the field. “I was amazed by the level of young energy in the Department of Civil Engineering and to hear about all the exciting research that the younger faculty is undertaking from clean water projects in Africa to BIM/Drone Visual Data software integration into streamlining of construction management of complex projects, very impressive!” Says Mark Vaghei, AIA. 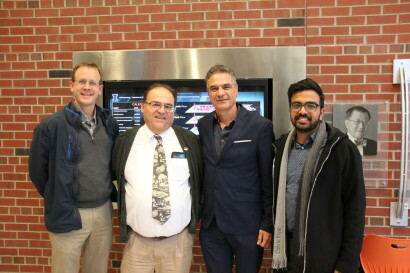 Mark also spent part of the day at the Department of Architecture and met with some of the faculty there including Abbas Aminmansour (https://arch.illinois.edu/faculty/abbas-aminmansour-phd) and Sudarshan Krishnan (https://arch.illinois.edu/faculty/sudarshan-krishnan-phd) . Mark was very impressed by the new Architecture Building also. atelier V would like to Thank Professor Marinas for his leadership and invitation of the Alumni for their Alumni Lecture Series. 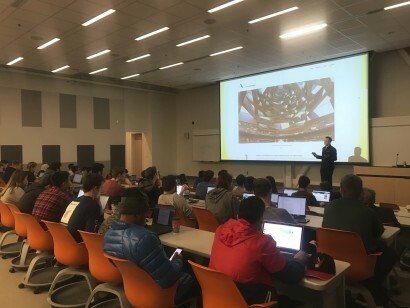 “In the last 35 years, no one from the Department had reached out and asked me to give a talk to the students until Benito called me, this is a testament to his progressive vision and synergistic leadership at the school, and I would like to take this opportunity to congratulate him” Says Mark Vaghei, AIA. atelier V would also like to thank Nishant Makhijani and Rhonda Frank for being such gracious hosts and assisting Mark to navigate the schools of Civil Engineering and Architecture throughout his stay in Urbana-Champaign. Department of Civil Engineering at the University Of Illinois Urbana-Champaign remains one of the top ranked departments worldwide.